I am currently in a full-fledged food writing kick. I’ve always loved to eat and cook, but reading and writing about food is a totally different experience. I stop and think about foods’ flavors, textures, colors and smells in a way I did not know possible. While browsing a used bookstore on Charlottesville’s historic Downtown Mall, I encountered a book I had been wanting to read for a while (per a friend’s recommendation): Kathleen Flinn‘s The Sharper Your Knife, the Less you Cry. 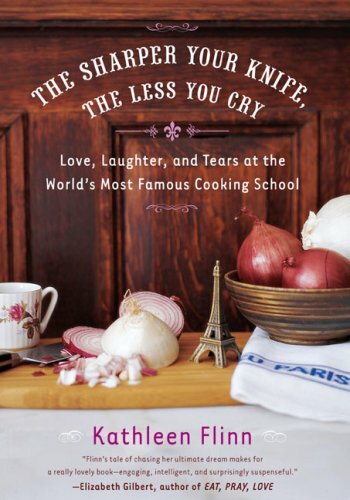 Flinn recounts her trials and tribulations while pursuing a degree, and her ultimate dream, from the world-renowned Le Cordon Blue cooking school in Paris. 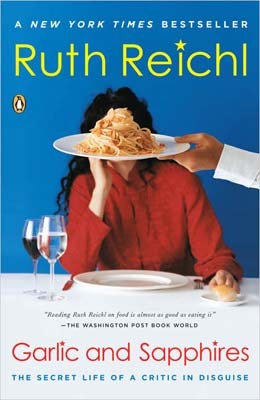 And speaking of a dream profession, after reading Ruth Reichl‘s life as the New York Times’ food critic, I, too, want to live for food. In Garlic and Sapphires, Reichl unabashedly moves from telling of her anxious and doubtful arrival to New York, to the glamorous life as the most revered critic in the city. Sure, quantifying the goodness of a chef’s hash browns, or potato-wrapped black bass in Barolo sauce or a chocolate souffle’ cake with whipped cream. I, for one thing, would run out of friends to bring to fancy restaurants after a week, but not Reichl. She has an arsenal of amusing companions—in addition to her husband and son—and disguises (it includes one where she literally become her mother…wig, jewelry and all). At first, I couldn’t believe I was reading an autobiography. In fact, it’s hard to believe Hollywood hasn’t jumped on it: The richness of her family life, the frustration with being recognized by restaurateurs and chefs alike and the discovery of new flavors—Umami. “Being a restaurant critic has its drawbacks: there are a lot of restaurant I haven’t yet eaten in,” reads the first sentence in one of her columns. “But it also has its advantages: there are a lot of restaurants where I am still not recognized.” Yes, I’d like to have that problem.